The Oskar Halecki Institute in Canada is pleased to announce the third lecture in its prestigious biennial series. The 3rd Oskar Halecki Memorial Lecture 2018 entitled „Should the Poles be proud to be Poles?” will be given by Bernard Margueritte, known French journalist, and correspondent in Warsaw, Poland and scholar (Harvard University, University of South Carolina, Catholic University of Lublin). 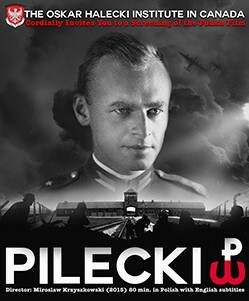 This public lecture with discussion is organized under Patronage of His Excellency Ambassador of the Republic of Poland, Dr. Andrzej Kurnicki, will take place on Friday, October 5, 2018, 7:00 p.m. in Amphitheatre G1124, Saint Paul University, 223 Main Street, Ottawa. Refreshments courtesy of the Polish Embassy. 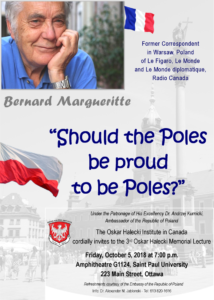 We would like also to invite you for His meeting with Polonia (in Polish) on Saturday, October 6, 2018, 6:15 pm, Parish Hall of Saint Hyacinth in Ottawa (after Holy Mass at 5 pm). Refreshments by organizers. Please distribute this invitation to your friends. The special poster-invitation and Press Release are attached. Dr. Alexander M. Jablonski, P.Eng.